We are excited to share some news with you: Simon Business School has been ranked No. 9 in the US and No. 19 in the world in a ranking of the top 50 MBA programs for entrepreneurship by Financial Times. This specialty ranking is derived from the core data Financial Times collects during their annual global MBA ranking and uses a weighted average of entrepreneurship criteria based on alumni survey responses. Within the Entrepreneurship category, Simon performed well in Equity (% of entrepreneurs who raised at least a third of equity via private investors) and Still Operating (companies that were still operating at the end of 2016). 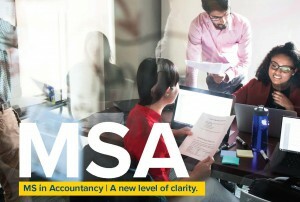 We also received high marks in all of the alumni network categories as well as the extent to which the School helped to both start and staff the business. This ranking is a testament to the School’s longstanding entrepreneurial focus and our strong partnership with the Ain Center for Entrepreneurship. We are so proud of our graduates and their success in start-ups and innovative small businesses. (In fact, one of our 2016 MBA graduates was recently featured in The New York Times for his entrepreneurial venture: Mo Shaikh co-founded the tech start-up Meridio—a Brooklyn company focused on introducing blockchain technology to real estate.) We seek to continue our momentum in this field and can’t wait to see the future accomplishments of our Simon MBAs. 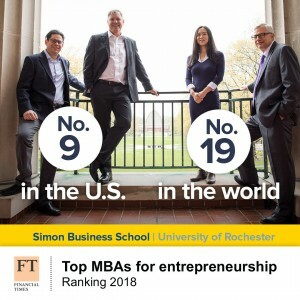 To learn more about our world-class MBA program, please visit our website or contact us at admissions@simon.rochester.edu to speak with one of our admissions officers. Application for 2019 Entry is Live! We are very excited to announce that our application for 2019 is now open! Our first deadline is October 15, and we encourage applicants to apply early for maximum scholarship consideration. I have included a few resources and tips below to support you during the application process. Applicants who apply by January 5 will be considered for participation in Scholarship Weekend—an invitation-only event where our largest merit awards, including full-tuition fellowships and named scholarships, are awarded. We have decreased our application fee from $150 to $90. We no longer require or accept letters of recommendation. As part of the online application, you will be asked to supply contact information for two references. If the Admissions Committee decides to contact either of your references during the application review process, you will be notified. We strongly suggest listing references who are familiar with you in a professional capacity. Keep in mind that fully answering each question, staying within the word limit, and using correct grammar and spelling are all important elements of writing a successful essay. Start developing your essays early and then read, re-read, and edit them accordingly. Then, once you’re ready, I encourage you to work on your application. As always, if you have questions or need assistance in any way, please reach out to the Admissions Office—we’re here to help you throughout this exciting journey of applying to B-school. We look forward to receiving your application and connecting soon! Simon is Headed to a City Near You! The 2018 Simon travel season has begun, and we hope to meet you out on the road! Check out our upcoming July and August travel dates (alphabetized by location) below. You can also visit our website for a complete list of upcoming events. Stay tuned for additional opportunities to meet up throughout the summer. Are you interested in meeting with a Simon admissions representative outside of a recruiting event? We’d love to schedule a time to have a more personalized conversation about your candidacy while we’re in your city! If you are interested in meeting, please email us a copy of your résumé. In your message, include which city listed above you would like to meet in. Availability is limited, so please respond at your earliest convenience. We have exciting news to share about a recent distinction for our MS in Accountancy program: we are now designated as a Science, Technology, Engineering, and Math (STEM) program under the United States Department of Homeland Security, effective the 2018–2019 academic year! If you have questions, please to reach out to us at admissions@simon.rochester.edu.